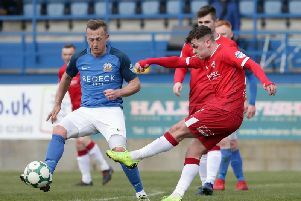 Oran Kearney's depleted Coleraine side eased past Warrenpoint Town in Saturday's opener at The Showgrounds. First half goals from Ian Parkhill and Stevie Lowry, were added to by Eoin Bradley at the second period to complete a good day for the Bannsiders, who had TEN first team players missing. It was the visitors who started the more assured as Lowry was forced to hack the ball off his own line after Eamon Scannell's corner was directed goalwards on 17 minutes. Coleraine hit back with Darren McCauley bringing a save out of Jonny Parr on 21 minutes before Chris Johns snuffed out a chance at the other end after the half hour mark. The home side broke the deadlock on 38 minutes as a sweeping move down the left saw Carson cross for Lowry, his effort was saved by Parr, but the ball rolled kindly for Parkhill who finished with aplomb. They doubled their advantage on the half time whistle as a sublime pass from Gareth McConaghie fed Bradley, who turned the pass back inside the Warrenpoint box, Alexander Gawne was dispossessed, but Lowry showed quick feet to round Parr and slot home. Less than a minute in to the second half Parr had a moment to forget as he completely missed his kick while attempting to clear Carson's through ball, allowing Bradley to fire in to the empty net. The visitors almost grabbed a goal back on 68 minutes as Ciaran O'Connor edged past McConaghie, Johns though was off his line quickly to parry the shot and Crown completed the clearance. Johns though had a let off three minutes later as his attempted punch clearance from McCaffrey's corner came off his own crossbar. The keeper did brilliantly to deny O'Connor twice in quick succession on 76 minutes after Alan O'Sullivan had hit the post. Wallace struck the woodwork again late on as Coleraine stood firm to claim all three points. Coleraine: Johns, Moore, Carson, Crown, McConaghie, Parkhill (Brennan 90+1), Harkin, Lowry, McCauley, Gawne (Whiteside 84), Bradley. Warrenpoint Town: Parr, Foster (Reilly 46), Hughes, Moan, McGrandles (Watters 46), O'Sullivan McCaffrey, M Lynch (Brennan 62), Scannell, O'Connor, Wallace. Subs: Turker, Brennan, J Lynch, Roohi, Halpenny.